John Donne—English poet, Anglican (Church of England) minister, and public speaker—is ranked with John Milton (1608–1674) as one of the greatest English poets. He was also a gifted artist in sermons and devotional writing. His works are notable for their realistic and sensual style and include sonnets, love poetry, religious poems, Latin translations, epigrams, elegies, songs, satires and sermons. His poetry is noted for its vibrancy of language and inventiveness of metaphor, especially as compared to that of his contemporaries. The son of a prosperous ironmonger (a person who sells iron or objects made from iron) of Welsh ancestry, John Donne (21 January 1572 – 31 March 1631) was born in London, England, and was raised a Londoner and a Roman Catholic. His mother, Elizabeth, a great niece of Sir (later Saint) Thomas More (1477–1535), came from a cultured, devout family: her father, John Heywood, wrote interludes (short plays that are put on during breaks in other entertainment); her brother Jasper was a Jesuit (a person who belongs to a Roman Catholic religious group called the Society of Jesus whose members are concerned with spreading their religious message and teaching); and her son Henry, John's brother, died in 1593 of a fever caught in Newgate Prison, where he was imprisoned for sheltering a Roman Catholic priest. Donne's father died when John was four, and his mother married a well-known physician. Donne was educated at home by Roman Catholic tutors until he was twelve years old. John and his brother Henry were then admitted to Oxford University, where he spent approximately three years. After some years at Oxford (from 1584) and possibly Cambridge, Donne studied law at Lincoln's Inn from 1592 to 1594. It was also in the 1590s that he wrote many of his love poems. He also composed poetic letters, funeral songs, and witty remarks, which were published after his death as Songs and Sonnets. Donne took part in the Earl of Essex's crusades against the Spanish in Cadiz, Spain, and the Azores in 1596 and 1597 and wrote about this military experience in his poems "The Storm" and "The Calm." By 1598, when he became secretary to Sir Thomas Egerton, he left the Roman Catholic Church. In 1601 he ruined the promise of a successful career by secretly marrying Lady Egerton's niece, Ann More, a union not approved by More's father. He was dismissed from his post and temporarily imprisoned, and for about a decade he and his growing family were largely dependent on relatives and patrons. During this middle period Donne wrote Biathanatos, which was published after his death by his son in 1646. His Pseudo-Martyr (1610) accused Roman Catholics of promoting false martyrdom (when a person or a group of people suffer or are killed for the sake of their religion) for financial gain. Ignatius His Conclave (1611) was popular in both English and Latin versions: it brilliantly mocks the Jesuits but is interesting today because it reflects the new astronomy of Galileo (1564–1642) and toys with the notion of colonizing the moon. Donne continued to write worldly poems and, about 1609 or 1610, he produced a powerful series of "Holy Sonnets," in which he reflected on sickness, death, sin, and the love of God. In 1611 he composed two companion poems, which honored the death of little Elizabeth Drury and won him the support of her father, with whom Donne traveled to France and Germany. He briefly served as a member of Parliament in 1601 and again in 1614. In 1615 Donne was ordained (to be officially installed as a member of the clergy in the church) a priest. Selected a royal chaplain (a member of the clergy who is chosen to carry out religious duties and services for the royal court) in the same year, he also received a doctor of divinity (the study of religion) degree from Cambridge. From 1616 to 1622 he was reader in divinity at Lincoln's Inn, where he preached regularly. He was widowed in 1617 by the death of his wife: she had borne him twelve children, five of whom died. He preached frequently at court and in 1619 was an embassy chaplain in Germany. In 1621, on James I's (1566–1625) selection, he became dean of St. Paul's Cathedral, attracting huge congregations with his brilliant public speaking. A serious illness in 1623 inspired his Devotions, which are moving meditations on sickness, death, and salvation. On February 25, 1631, Donne left his sickbed to preach his last and most famous sermon, "Death's Duel". On March 31, 1631, he died. A statue of him wrapped in funeral shrouds is preserved at St. Paul's Cathedral. The figure is that of an old, seasoned man who has thought and suffered greatly but has achieved some peace of mind. Donne's was a complex personality, an unusual blend of passion, zeal, and brilliance; God and women were his favorite themes, but his subject otherwise ranged over the pagan (people who do not worship the Christian God) and the religious, the familiar and the unclear, the sarcastic and the sincere, the wittily bright and the religiously wise. Largely because of Izaak Walton's (1593–1683) charming but somewhat unreliable Life of Dr. John Donne (1681) and because of the risqué elements in Donne's worldly poetry, a myth grew up contrasting his younger days as an attractive conversationalist and socialite with his older, more religious and devout self. His works reveal that he was always a serious student and a seeker after truth; and there is no sound evidence to support the myth. Certainly after his ordination he dedicated his remarkable genius wholeheartedly to the service of God and thus became one of the most brilliant stars of the Anglican priests, whose exceptional literary genius was dedicated to the glory of God and the welfare of man. 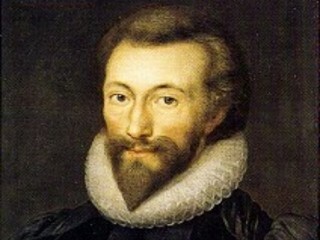 View the full website biography of John Donne.